This article presents three technology tools to create an exciting environment for inquiry-based learning. ICT tools provide students with the independence to create on their own which also helps develop their initiative and confidence. This was clearly visible when grade 4 students were using ICT apps in the How the world works unit of inquiry with the central idea “Mysteries of the universe can be unravelled by human exploration”. create a presentation to explain their understanding of these parts of universe. To accomplish these tasks students needed to access various websites for gathering suitable information related to their topics. With so many students working on this project, the information was pooled. As an ICT teacher, I knew that the students’ hard work had to be preserved for easy reference as and when required. In that sense controlling the flow of information was a challenge. To overcome this flow challenge, I introduced my students to the QR codes (Quick Response codes). These codes can be easily created using various websites which provide a linking facility with webpages, articles and videos that can then be displayed on the class display boards. Students can access the information hidden behind these codes with the help of cameras on mobile devices such as an iPads or smartphone. The information will be visible on the device through a code scanning app and in a Wi-Fi environment. I was delighted to note that my students enjoyed learning and creating these simple codes. To enhance organization skills in my students, I guided them to choose the two sites most useful on their topic of research and to create QR codes to display this information in their classroom. Since students were learning about the universe, I was looking for some real time apps to help them visualize and identify positions of stars and various constellations. After some research and online reviews, I came across this app called SkyWalk. Here the students use their existing knowledge about constellations to help in searching for them using real time technology. Using the SkyWalk app, students moved around in the classroom sharing the images of various constellations with their peers. It was interesting to see how students took ownership of their learning and teachers became observers. I originally planned this research activity keeping only Sky Walk in mind. However, when the activity was in progress, I realized that students could immediately communicate information to others by creating an audio visual presentation using iMovie which is readily available on the iPad. This audio visual presentation could then be used as a formative assessment. After all the constellations were located and the pictures selected, they utilized iMovie to collate all the images into an audio visual presentation. They then added their voice thus reflecting their understanding. It was an informative project for the students and they learned the term ‘AppSmash’ as they incorporated multiple apps to complete the project. These presentations were shared on Google drive and OneDrive with links being shared with other students. They created QR codes based on these links and displayed them in their classrooms. You can always tell that learning has taken place when students take their learning and discuss it at home. I heard so many appreciative comments during the Parent Teacher Meet where parents told me they learned about Skywalk, QR codes and app smashing from their children. It was especially gratifying to see children apply these tools to subjects unrelated to school, such as a birthday invite. It never ceases to amaze how much the enthusiasm and creativity of our students flourish when such technology platforms are provided to them. Share which digital tools you use in your classroom and why! 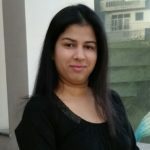 Ekta Singh is a PYP and MYP ICT and Digital Design teacher. She enjoys sharing new and innovative tools in her classroom. She was selected as a Microsoft Innovative Educator Expert in the year 2015-16. You can follow Ekta on Twitter @ektadsingh. Great to read your article Ekta! It’s amazing how technology can take an inquiry forward so smoothly, making the students enthusiastic about their learning at the same time. Wow! This is an amazing way of integrating ICT. Amazing Ekta. Keep it up.